www.showcasemedialive.com Copyright ÂŠ 2010 ShowCase Media. All rights reserved. Located parallel to I-5 on the west side between 38th Street and 48th Street in Tacoma, Washington. Shopping Line速 253.475.4565. Start with Modern European kitchen essentials. Blend sophisticated designs for home entertaining. Finish with conscious pricing. concert tickets, All shows reserved deals seating & discounts! and include FREE Puyallup Fair gate admission. Tickets at thefair.com, Ticketmaster Outlets or 1-8OO-745-3OOO. No service fee at Puyallup Fair Box Office. Susan Fahsel calls herself an artist and a “creative queen.” She claims her creativity even keeps her up at night. Because that’s when the ideas come. In fact, one of her middle-of-the-night jewelry creations began with fishing line, a metal washer, and a magnet. That rough inspiration for a necklace, cobbled together with abandoned stuff in a junk drawer and a little elbow grease, has evolved into her new business, Magnabilities. Identifying as an artist as early as she can remember, Fahsel grew up back East in Pennsylvania. There she finished high school, attended art school, and worked as a point of purchase designer in her early 20s. After a big move across the States to Portland, Oregon, Susan continued her arts career and in 1994, she started up Susan’s Signature—a graphic freelance business. By 1996, Susan moved to Seattle and used her entrepreneurial spirit and art skills to hand draw advertisement chalkboards for promoting beverage brands like Absolut and Bacardi. “Absolut Vodka hired me to do over 100 chalkboards by hand, and then the signs evolved into interchangeable graphics by the use of magnets. I thought, if I can do this with my graphics, what else can interchange? Quickly my graphics shrank to coin-sized magnetic designs and Magnabilities was born!” Now, running the business from her office in Lake Tapps, Magnabilities is a trademarked magnetic jewelry system. With a patent pending and an addictive online shopping presence at www.magnabilities.com, customers can create their own Magnabilities looks in three easy steps. After selecting a necklace length, shoppers can browse numerous magnetic design inserts then they choose their favorites to add to the pendant of their choice. The colors, styles and selections for creating just one necklace can become an easy and affordable way to own an entire fashionable jewelry collection. Downtown window shopping in the brisk morning air, searching for the perfect outfit to catch your eye... The moment your quest is complete and the outfit is found renders your search worth each step taken or crowd encountered. Hours of foraging are over with the latest and greatest local venue, Belleza Ropa, ideal for all of your shopping desires. Affording a noticeably comfortable environment, Belleza Ropa (Spanish for beautiful clothes) represents the respectable, feminine, yet novel era of contemporary taste and truly lives up to its name. Debray’s boutique has options that accent the beauty of a shoppers natural allure, taking into consideration busy social schedules and providing wardrobes fitting to all occasions. and Bistro With 10,000 square feet showcasing over 70 dealers who selectively and creatively display visually pleasing presentations of exquisite antique and vintage treasues, shop for unique home decor, gifts and more with price tags that are easy on the pocketbook. Be sure to stop in the Bistro for scrumptious home made items served for breakfast, lunch or a coďŹ&#x20AC;ee break. everyday ergonomics Find your around the clock solutions for back pain. A boutique for the unique woman. All ages, all sizes, plus, too! Families change, assets grow, teens drive, and retirement comes. Communication is vital to learn about changing needs. Frequent service calls are customary allowing our team to educate clients about discounts and coverage adjustments. The Morales team respects the value of long term client partnerships and is there when your life changes. When was the last time your insurance agent called you? Insurance is complicated, but service is simple when you partner with The Morales Agency. The cornerstones of The Morales Agency philosophy are Partnering, Education, Service and Respect. Give the Gift of Experience! No matter what your dining pleasure is, you will surely find what your palette desires in the “2010 Best of Dining Guide”. From rustic pubs and casual family dining to the most elegant settings and extravagant fare, we “showcase” our favorites and recommendations. Take in a new restaurant, taste an old favorite or learn about a hidden spot that is a “best kept secret”. We acknowledge the best to help you plan your culinary adventures. The oldest seafood restaurant in Washington, The Oyster House, overlooks Olympia’s Percival Landing and Budd Inlet. It’s a casual family eatery where diners can watch televised athletic events and view sports memorabilia displayed in the lobby. Dark wood and rich green colors make the dining room warm and welcoming. We began with angels on horseback—oysters wrapped in bacon, skewered and then broiled. As the shellfish cook, they curl, resembling angel wings. The smoky cured pork, sweet mollusks, and zesty cocktail sauce are a satisfying starter. Others include Cognac oysters, crab cocktail, nachos and potato skins. The house dressing is fresh ginger vinaigrette. Mixed greens come alive with flavor when combined with the spiciness of the pungent root. bacon wrapped filet mignon, teriyaki chicken sandwich or baby back ribs. Salad entrées range from cobb to seafood louie to wonton chicken. A variety of tempting options are presented on the dessert tray, including mud pie, M&M fudge brownies, bread pudding with caramel sauce, cheesecake and chocolate cake. Fudgy French silk pie is decadent with a double crust—dense brownie on sugar cookie; a tunnel of caramel is hidden within the filling. Multi-layered banana poppy seed cake is slightly lemony and the flavors are enhanced by buttercream. Appropriately, the dining establishment began as an oyster culling house owned by the Olympia Oyster Company. As far back as 1859, the company shipped the delicacies to San Francisco where diners would pay $20 per plate. Eventually, the original owners started a small seafood bar in the southeast corner where oyster cocktails were served. Pacific oysters are lightly dusted with flour and pan-fried in butter. The delicate shellfish are accompanied by tangy cocktail sauce, a lemon wedge, and choice of baked potato, rice, vegetables or fries. The grilled halibut sandwich is wellprepared, the flatfish firm and fresh. The Oyster House buys local seafood whenever possible; it’s purchased fresh seven days a week. Only oysters from Oyster Bay, procured from Olympia Oyster Company, are served here. In the 1940s, the eatery began to evolve into a larger operation. Two or three additions were completed before it was purchased and completely remodeled by the current owner, Rich Barrett, in 1996. The establishment is still patronized by loyal elderly diners who reminisce about the restaurant’s evolution. With public docking available, it’s also a popular place with boaters and families. Not unlike bistros and cafés in France and Italy, Mama Stortini’s is the community gathering place where food is savored and friends mark the spontaneous moments in their lives. The welcoming scents of minestrone, Bolognese sauce and pizza waft from the kitchen into the dining area. The atmosphere is casual. Framed artwork adorns each booth; adding interest are antique candlesticks, lamps, and plants placed on low partitions. Stortini’s resides in the space formerly occupied by Zephyr Bar & Grill at Kent Station. The remodeled eatery feels open yet intimate. A bank of windows adds light; cozy booths are suitable for a romantic dinner; larger booths and tables can accommodate a family or group of friends. Seating is also available in the bar or outdoor patio. The wide-ranging menu is suitable for a variety of situations and occasions, from grazing to special occasions. The menu has many choices and a range of prices to appeal to a wide variety of expectations, needs and occasions. Flavors are simple, bold and delicious. Diners can be assured of high quality and creativity. Portions are attractively presented and generous. Starters include smoked mozzarella and tomato bruschetta, crispy calamari, and coconut crusted black tiger prawns. Maytag blue cheese salad, grilled steak salad, and chicken and pear salad with maple vinaigrette are a few of the many salad offerings. For more than three decades, The Melting Pot has defined the fondue niche across the American dining scene. A fun and interactive dining experience, fondue is a communal dish shared at the table in a pot over a small burner. To create The Melting Pot’s spinach artichoke appetizer the server mixes two cheeses—pungent Italian Fontina with, as its name suggests, buttery Butterkase—with spinach, tender artichoke heart petals, and ample garlic, sweetened by the cooking process. Provided for dipping are three varieties of bread, tortilla chips, tart Granny Smith apples, and crispy carrots and celery. Other appetizer options include Fiesta Cheese Fondue, made with jalapeno peppers and salsa; the traditional Cheddar Cheese Fondue is also available. French Quarter is made up of filet mignon, chicken breast, and shrimp, all seasoned with spicy Cajun spices and partnered with Andouille sausage. Or, try the Land and Sea or Pacific Rim entrees. Entrees are accompanied by potatoes and mushrooms. Among the several condiments presented are aromatic and tangy yogurt curry dip, sweet, gingery plum sauce, teriyaki, parsley and chive seasoned green goddess spread, and Gorgonzola and Port sauce. The Melting Pot House Salad is composed of crisp greens, cheddar cheese, hard-boiled eggs, mild scallions, fresh tomatoes and crunchy croutons. The house dressing is sweet and tangy, reminiscent of honey mustard. Chocolate S’mores fondue is creamy milk chocolate topped with marshmallow cream, flambéed, and garnished with crushed graham crackers. For dipping are sweet ripe strawberries, dense pound cake, creamy cheese cake, brownies, bananas, and marshmallows. Other sweet conclusions are Yin and Yang, a half dark chocolate and half white chocolate fondue and flaming turtle, a decadent milk chocolate, caramel and chopped pecan blend, flambéed tableside. Main courses may be simmered in a variety of preparations. Coq au Vin is flavored with fresh herbs, mushrooms, garlic and burgundy wine, while Fondue court bouillon is a homemade seasoned vegetable broth. Recommended by our server was Mojo Fondue, a Caribbean-seasoned bouillon flavored with garlic, tangy citrus and cilantro. Although Olympia’s SWING Wine Bar just swung its doors open in 2007, its reputation is already being toasted across the state. In only a handful of years, this lovely restaurant and wine bar has established itself as one of the best places in the South Sound to savor classic Northwest cuisine and sip award-winning Washington wines. In fact, the Washington Wine Commission presented SWING an award of recognition for their great local wine offerings just this year. will appreciate the specific Pacific Northwest twist the chef puts on old favorites like roast beef and chicken. For example, juicy pot roast takes on a new herbed freshness with a rosemary infused au jus. Roasted chicken becomes rustic when smothered with sage and a creamy, local Beecher’s white cheddar sauce. The savory filet mignon here is topped with local wild Washington mushrooms. Zesty apple and ginger glazes the fresh salmon smoked daily on the back patio. Perched atop Columbia street in downtown Olympia, SWING is a cozy, big, red, refurbished house nearly a century old with an awe-inspiring view overlooking Capitol Lake. Owner Nicole Butigan fell in love with the place immediately. She knew that the view was really the perfect backdrop for both locals and tourists alike who love having a lush natural Washington landscape incorporated into their meal experience as they sip on Columbia Valley wines or savor locally-caught salmon. “We love Olympia, and it really needed a wine bar. 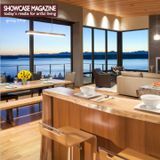 The view is fantastic and the house has so much charm,” said Nicole. There is also a fun way SWING serves up their wine. Guests can order ‘wine flights’—an iron tree-shaped stand that holds three 2 ounce pours of wines with a common theme by varietal or region. “The wine flights are an absolute standout,” said Nicole. It’s a great way to enjoy the progression of three different wines with deepening flavors and body as the meal moves from appetizer, to salad, then to entrée. Once and old empty house, SWING is now a home to a candlelit wine bar teeming with romantic dinner tables, fresh-cut flowers, a gorgeous outdoor dining patio, a well-stocked Washington wine cellar, guest jazz musicians, and a creative and cost-effective happy hour where signature SWING cocktails such as It’s 5 o’ Clock Somewhere, Walk The Line, and Ring My Bell. dining In April 2008, Amy and Peter Chen of Olympia opened Fujiyama Restaurant on the Westside. They have brought a taste of Tokyo to Olympia by serving traditional ‘Teppanyaki’ cuisine—a style of Japanese fare that uses an iron grill to cook the food (Teppan= iron plate, Yaki= grilled)—Fujiyama also puts their personal spin on the delicious tradition. Fujiyama got me most thrilled about their grilling because of the talented chefs, the freshest local seafood and meats they serve, and their creative, Asian-inspired cocktails. There, chefs prepare your meal theatrically to order; grilling meat and vegetables right at the table. Our knife-wielding, singing and joking chef Glen Amberson, was one of the most talented I’ve ever seen. This chef was more like a oneman show. He bounced and balanced eggs on his spatula. He created a flaming volcano out of stacked, thick slices of onion and homemade garlic butter. And he flipped a perfectly seared sea scallop off the grill, tossed it mid-air, then landed it deliciously centered on my plate. Fujiyama really gets grilling with high quality meats and fresh caught seafood. You’ll find excellent entrees in all of their Hibachi listings. Steak is plentiful and popular, and they offer the best cuts to include New York, Rib Eye, Filet Mignon and a 10 oz Center Cut. Their seafood offerings are local and fresh and the steak/seafood combinations can be made up with succulent choices like shrimp, salmon, scallops or lobster. 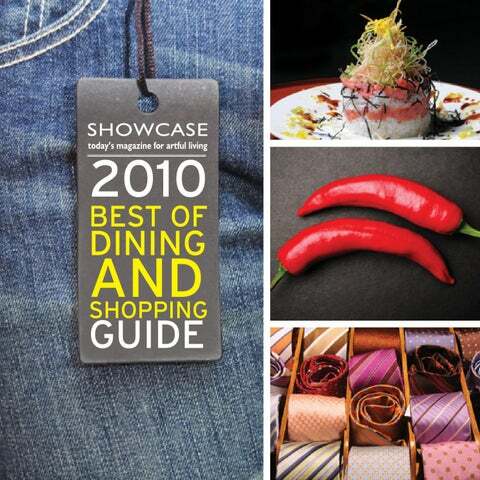 Showcase Magazine's Best of Dining & Shopping Guide 2010. Today's magazine for artful living.